Grota Homestead Neighborhood in Harris County is one of 12 sites that Preservation Texas, Inc. has named to its tenth anniversary retrospective list of Texas’ Most Endangered Historic Places. Grota Homestead, located near the late 19th century community known as Germantown just northwest of downtown Houston, was the beginning of Grota Homestead Neighborhood. Platted first for residential development in the 1890s, the subdivision increased in size with subsequent plats through 1920. Primarily a working and middle class neighborhood, Grota Homestead is an integral component of the early 20th century suburban development that included the adjacent Woodland Heights neighborhood. After World War II suburban development sent the area into a slow economic decline and construction of I-45/North Freeway in the 1960s resulted in the demolition of many homes, severing the area’s connections to historic neighborhoods to the east. Resident Wendy Parker organized volunteers in a revitalization effort to protect their historic homes and the architectural character of the neighborhood which contains a collection of early 20th-century houses, including vernacular Victorian cottages and Craftsman bungalows. 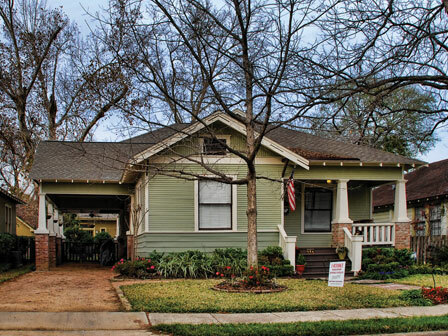 Their efforts were rewarded in December 2012 when by a vote of the Houston City Council, Grota Homestead Neighborhood was designated the Germantown Historic District. With this designation, residents can take the next step and seek listing in the National Register of Historic Places. The Grota story is compelling not only because it has been saved, but because it reflects the overall effort to protect historic neighborhoods and commercial buildings in Houston. When Grota Homestead was nominated for its Texas’ Most Endangered Historic Places designation there was only one historic district with full protection in Houston; now there are 19 residential protected neighborhoods and one commercial district.